Picking the right tea kettle isn’t an easy task. Since, today, we have different needs. We need something which is portable, lightweight, and with all the advanced features. Besides, there are lots of models in the market that can paralyze a person with bafflement. 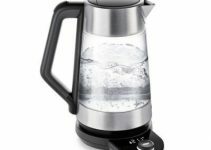 If you are looking for an electric kettle too, with all the advanced features, buy this Electric Gooseneck Kettle. It’s from Doctor Hetzner, and it doesn’t challenge your wallet either. When it comes to design, Doctor Hetzner Electric Gooseneck Kettle wins the competition. Unlike other kettles, it doesn’t have any kind of design or usability flaw. Even after months, the design looks lavish and doesn’t get rusty. Again, we’d like to talk about rust here, as the biggest complaint about the electric kettles is rust. Doctor Hetzner manufacturers have used stainless steel design, for that reason, it won’t rust overnight. It will work for a very long time and serve professionally. The capacity of an electric kettle matter, especially if you are a regular user. Most believe that it is better to go with the biggest kettle to have hot water around all the time. However, this requirement can give lots of trouble and compel you to compromise on the portability feature. Luckily, this inventive electric kettle has 1L recommended capacity. You won’t have any trouble if you are planning to purchase it for a family. 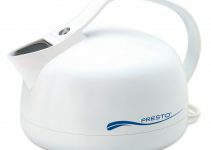 It is the first Gooseneck kettle with preset temperature control. This exceptional feature doesn’t let it burn your coffee or tea leaves. You relish a fresh cup of tea whenever you want. Normal and other conventional kettles don’t have this feature and often compel you to deal with burned coffee taste in the mornings. This electric kettle also has a precision digital control system. Once you press the power key, it automatically set the default temperature 212o You can adjust it rather comfortably according to your requirement through + and – keys. It boils water rapidly. Therefore, fill only 1L water to avoid any kind of over spilling. Manufacturers have equipped it with Strix internal temperature. It assists in handing you pure tasting coffee in just a few minutes. Furthermore, this system also has automatic shut-off option, once it reaches boiling it. This feature keeps it intact in the long run. Doctor Hetzner electric kettle also has safe food-grade stainless steel. It means you don’t have to encounter any kind of bacteria, bad smell, or corrosion. In addition, they offer 30-days unconditional return too, in case you face any kind of mishap. It is an impressive-looking kettle with attention-grabbing features. Though, before opting for it, there are a few things you must consider. For example, don’t touch the sides of this kettle when water is boiling. It can burn your hands. Second, according to its manufacturers, don’t leave still water in it for a prolonged period if you want it to work great, all day and every day. On the whole, Doctor Hetzner Electric Gooseneck Kettle can be a huge help in the kitchen.